Earlier this morning, I introduced you to Crisdale the Unworthy. Now, I’d like you to meet the next character in our party of adventurers for The Tome Show Presents The Round Table’s Tarrasque Takedow 2014: Mike Shea Out For Blood. Meet Malachi Moonriver, Human Circle of the Moon Druid, played by cool guy Joe Lastowski. More cool stuff to come! For those who need the details of the event, check it out below! Mike Shea, Topher Kohan, Joe Lastowski, Christopher Dudley and I discovered during a recent episode of The Round Table podcast that we had no idea how high-level play would shake out in the new edition. So, Mike graciously agreed to DM us through a series of level 20+ encounters culminating in an all-out, no holds barred, punch you in the face, over the top battle with my main monster the Tarrasque. If you want to be there live this Sunday, September 21st at 7:30PM Eastern – click the event link. You can also watch on youtube. If you can’t be there live, the YouTube video will live at that address and we’re releasing the audio as podcasts on The Tome Show’s website! Thanks, Jeff Greiner! 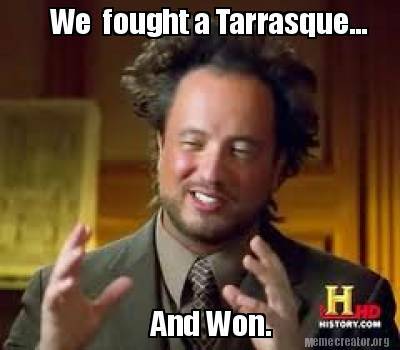 If you’re going, please tell your friends and on social media use #TarrasqueTakedown. I would love to be mocked in a live tweet stream, so please, help me complete a life goal.